The aim is to get all the numbers out,Sturdily-built classic wooden Shut the Box dice game - simple to learn and a fun way to develop numeracy skills,For one or more players,For one or more players,Wooden board with felt playing area.Throw the dice and flip down the numbers that add up the total. The aim is to get all the numbers out. 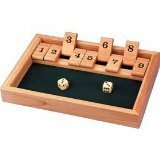 Sturdily-built classic wooden shut the box dice game. Simple to learn and a fun way to develop numeracy skills. Wooden board with felt playing area. If you have any questions about this product by Tobar, contact us by completing and submitting the form below. If you are looking for a specif part number, please include it with your message.